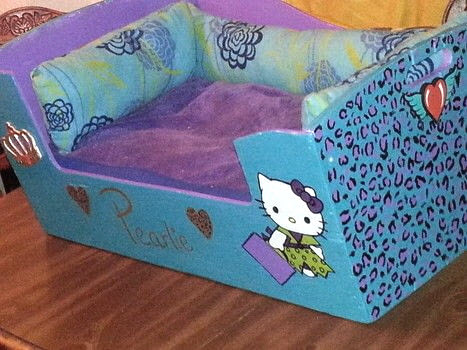 Convert a wood crate into a bed for your dog! Get a wood crate that has a dip in one side, or cut a dip out of one if needed. Paint and decorate the crate, then cover it with sealant. Put a pillow in the crate for a mattress, and sew a pillowcase to match the crate if desired. Measure the sides of the crate, cut rectangles of fabric to the lengths needed for each side of the crate, sew two matching rectangles together and stuff them to make pillows, then sew the pillows together to make a bumper pillow for the bed.